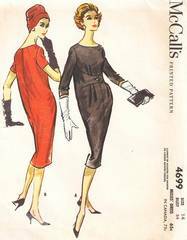 Vintage McCall's 4699 pattern is a perfect example of the "sack dress" which is credited to both Givenchy and Balenciago in 1957. This particular dress is tapered at the lower edge - a bit more of Balenciago's style. Tab extensions with a single button nip in the front, every so slightly, just above the waist. Pattern is complete and neatly cut . Envelope and contents have age toning. Copyright 1958, McCall's was quite astute in releasing this design so quickly.